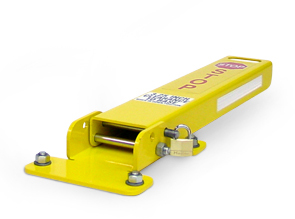 These heavy-duty collapsible bollards are a strong and steady deterrent for preventing unauthorized traffic from attempting to gain access to vehicle restricted areas. Great for both biking and walking trails—also widely used for service roads, driveway entrances and parking lots. 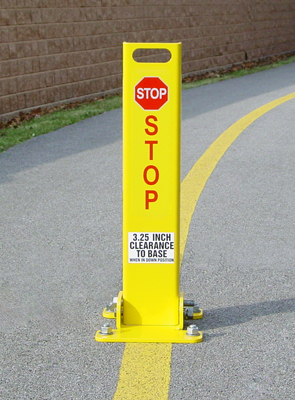 These high visibility "safety yellow" bollards are 6" wide, offered in both 30" and 48" heights. When collapsed, its clearance to the base is 3-1/4". The body of this bollard is constructed of 1/4" steel and the base is 3/8" steel. The included hinge and locking pins are 3/4" x 8" stainless steel. Optional zinc coated or stainless steel anchor bolts are available. The bolts 3/4"Dia. x 12"L hooks and include the nuts and washers. Safety Labels with recommendations for affixing are included in the hardware kit. The innovative open back design solves the inside-out rusting issues common with enclosed tube steel bollards. Allows the entire bollard to be sealed with a state-of-the-art powder-coat finish, plus all surfaces naturally dry faster after inclement weather.